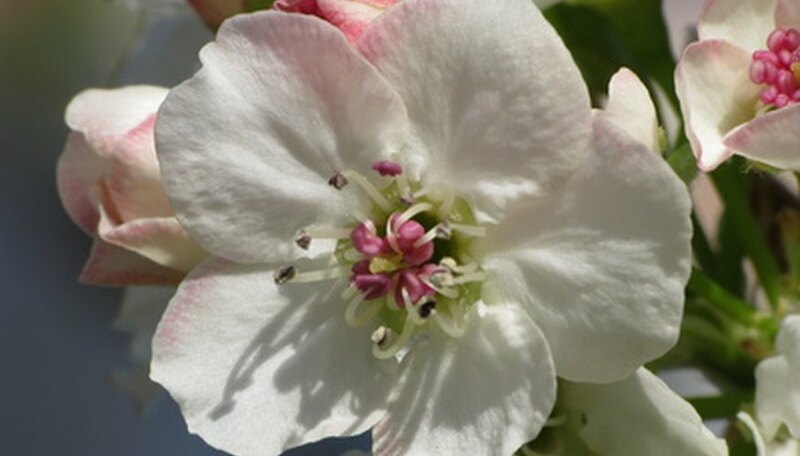 Bradford pear is an ornamental pear tree that is known for an early show of white flowers. Many residential landscapers have incorporated Bradford pear trees into landscaping because of their attractive springtime display and the tree’s tendency to grow quickly. But Bradford pear trees are a softwood tree with a tendency to break in high wind or storms. In order to extend the Bradford pear tree’s life, you must prune it extensively to establish a strong shape. Prune Bradford pear trees extensively in late winter for the first two years after the tree has been planted to establish the tree’s shape. Sharpen your pruning tools before pruning the tree by drawing a sharpening stone down the blades. Clean the blades of each tool with a cloth that has been soaked using a solution of one part bleach and nine parts water. Using sharp tools will prevent damaging the tree. Cleaning the tools will help to avoid the spread of infection. You will use a handsaw, branch loppers and pruning shears to prune your Bradford pear tree. Remove the weaker leader on a tree with a forking trunk. Bend any branches growing at a narrow angle outward so that they grow at a 90-degree angle. Brace these branches with a strong stick so that they are trained to grow outward. Branches that grow at a narrow angle are prone to break. If you cannot bend the branch so that it will grow at a 90-degree angle from the tree, remove the branch. Remove branches in tiers to promote circulation and light penetration in the canopy of the tree. Leave the branches in a row, called a whorl, on the lowest level of the tree. Then remove branches in the second whorl. Leave branches in the third whorl. Continue this way up the tree. Prune away weak, spindly growth that emerges from the lower part of the trunk or the lower part of the limbs. When this growth appears on the trunk, it is known as sucker growth. When it appears on limbs it is known as water sprout growth. Both suckers and water sprouts can steal energy from a tree that would help the tree to thrive and grow. Remove limbs that cross the canopy, rub other branches or grow too closely together. Cut back any limbs that are taller than the overall growth of the tree. The limbs should be cut to a point just before an outward-facing bud. Remove any dead, damaged or diseased limbs. Make each cut at a slanting angle away from the tree. Begin each cut just outside of the growth ridge where the limb meets the tree. Then slant the cut at a 45-degree angle away from the tree’s trunk. Always wear protective clothing, including sturdy gloves and eye protection, when pruning a tree. According to the University of Florida, the tree provides a catch-22, because it will require pruning to maintain a strong shape, but looks odd and misshapen once it has been pruned. Never remove more than 1/3 of the tree’s total growth in a single year.